Hamilton finished fourth at the Autódromo Hermanos Rodríguez, enough to beat Sebastian Vettel to the title. It was the culmination of a season in which he has been in the form of his career, driving virtually flawlessly in taking nine wins and nine pole positions. However, three days before the race Hamilton had to cope with the emotional impact of the death of his paternal grandfather, Davidson Augustine Hamilton. “This has actually been a really difficult weekend because my grandfather died on Thursday morning,” he said. This is Hamilton’s 12th season in Formula One and his route from a council house in Stevenage was enabled by his father Anthony, who supported his racing by taking multiple jobs. Hamilton began karting at the age of eight at the Rye House Circuit in Hertfordshire and was emphatic about how important his father had been. Hamilton has matured as driver. 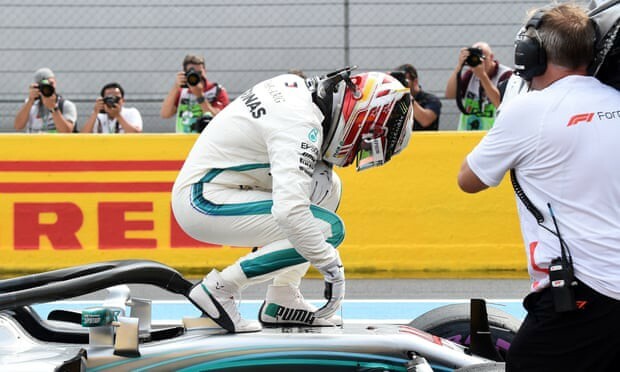 He once again demonstrated in Mexico his exemplary control and judgment under pressure as he brought his car home for the title, despite being off the pace and struggling with his tyres. But he also emphasised the key role his father played in shaping his driving style. The lessons learned then were key and have been carried through his career. Tellingly he has also lost none of the passion he felt when he first climbed behind the wheel. This motivation has led to a superlative season. For all that Ferrari and Vettel made errors it was without doubt a title won by Hamilton and Mercedes rather than lost by his competitors. It has included some of his most impressive drives — coming from the back of the field to be second at Silverstone, winning from 14th in Germany, the qualifying laps in Singapore and Hungary that put him on pole. “It took some special laps, it took some special moments in the car and I honestly could just re-live those moments all the time,” he said. “Some of those experiences I had in the car were really magical. I truly believed that we could win this championship but it has been the toughest battle that we’ve had collectively as a team.